An eight- or nine-hour ramen broth is as likely strike you as excessive and obsessive as it did me when I first read the recipe. But I do love a good ramen broth. This looked promising. Not only did I want to make a bowl of ramen that stood a chance of comparing favorably with broth in a ramen shop, I also recognized that it was a necessary component of David Chang’s absolutely scrumptious Shrimp & Grits recipe (to follow). This recipe’s essential virtue is umami, which, to the degree that I can describe it, is Japanese for “pretty frickin’ delicious,” as distinct from “salty,” “sweet,” or “sour.” Chang builds the broth in layers of flavor: first the konbu, then the mushrooms, followed by the chicken and then the pork bones. The result is a deep, complex broth whose flavor turned out to be less fragile and more stable than I anticipated it would be. Following Change’s advice, I reduced the final broth by half to save space in my freezer. If you boil it down, you can reconstitute it with an equal amount of water. However, I’m going to provide here an adulterated version that no doubt you will still find excessive in the amount of time it takes. If you want the complete recipe, buy the book. It’s worth it. Here, you get a second-rate broth that is not such a big production as the full version. Smaller amount and a bit less work may lead you to make it more often. David Chang would probably spit on my efforts, but that’s ok. We need purists like him against which we measure what we do. Shadowcook: If you can’t find organic pork bones, try using smoked ham hocks and skip the smoked bacon. It would be a good idea to have a butcher cut the hocks in two or three pieces, depending on their size, since you’ll be roasting them. Shadowcook: Towards the end of making the full version, as I tasted the broth and adjusted the seasoning, I thought the smoky flavor dominated the other subtler ingredients. I still do, although the smokiness calmed down by the time I got to straining the broth. So, be aware of how strong the smoky flavor of the bacon is. 1. Rinse the konbu under running water, then combine it with the water in a stockpot. Bring the water to a simmer over high heat and turn off the heat. Let steep for 10 minutes. 2. Remove the konbu from the pot and add the shiitakes. Turn the heat back up to high and bring the water to a boil, then turn the heat down so the liquid simmers gently. Simmer for 30 minutes, until the mushrooms are plumped and rehydrated and have lent the broth their color and aroma. 3. Heat the oven to 400 degrees. Put the pork bones or ham hocks on a baking sheet or in a roasting pan and roast for an hour. Turn them over after 30 minutes. 4. Right after putting the pork bones in the oven, remove the mushrooms from the pot with a spider or slotted spoon. Add the chicken pieces to the pot. Keep the liquid at a gentle simmer. Skim and discard any froth, foam, or fat that rises to the surface of the broth. Replenish the water as necessary to keep the chicken covered. After about 1 hour, test the chicken: the meat should pull away from the bones easily. If it doesn’t, simmer until it does. Then remove it from the pot. 5. Remove the chicken from the pot and add the pork bones or hocks to the broth, along with the bacon (if you’re using pork bones). Adjust the heat as necessary to keep the broth at a steady simmer; skim the scum and replenish the water as needed. After 45 minutes, scoop out the bacon and discard it. Then gently simmer the pork bones for 6 to 7 hours. Stop adding water to replenish the pot after hour 5 or so. Shadowcook: Does it need that long? I’m skeptical. But I went whole hog anyway. When I made the abbreviated version, however, I stopped after four hours. The broth was fine. Follow your tastes buds and please yourself. 6. Add the scallions, onion, and carrots to the pot and simmer for the final 45 minutes. 7. Remove the bones and vegetables. Strain the broth through a sieve lined with cheesecloth. At this point, either use the broth or reduce it by half to freeze. Reconstitute with equal amounts of water. Shadowcook: At this point, Chang instructs you to finish the sauce with a bit of taré, a concentrate of salt, soy sauce, mirin and the gook that accumulates around roasted chicken backs. Sorry, I own up to not having made this sauce, which is its own recipe. Finding chicken backs — much less organic ones — is tough even in our Asian markets. So, to finish the broth, I seasoned it with the tablespoons of dark soy sauce and mirin and adjusted the salt. I was happy. 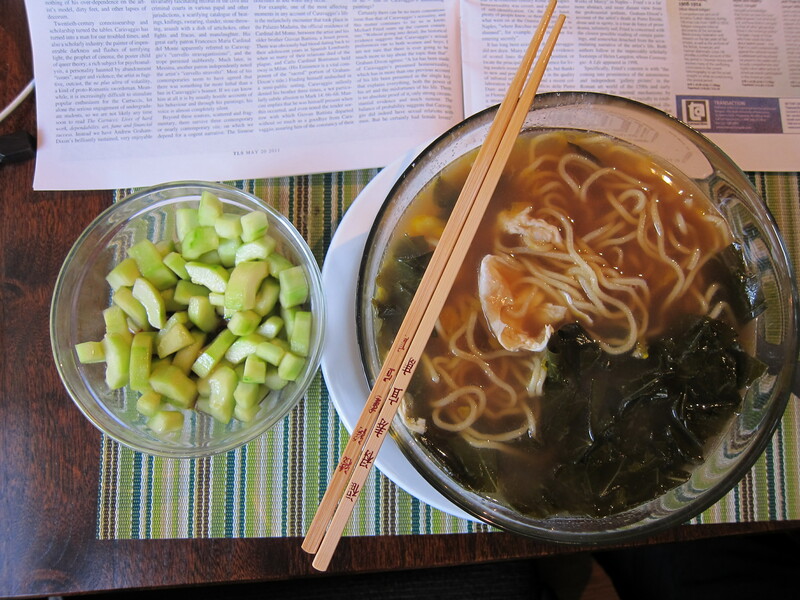 Chang concludes this recipe with a sentiment in which I heartily concur: Underseasoned broth is a crime.